The quality keeps on coming. A&BC Chewing Gum and FKS produced their best sets ever. 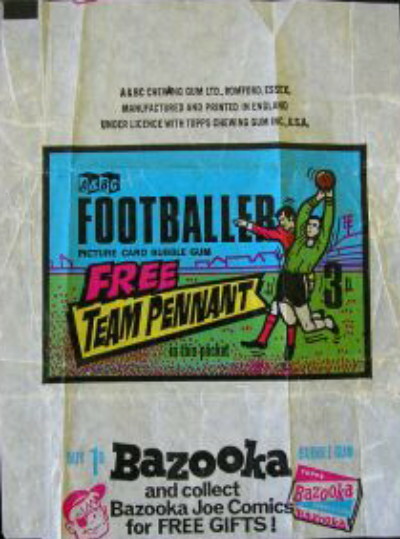 In my view this is the pinnacle year for football cards in the 1965/66 to 1979/80 period. Similar to the English yellow backs of the same year. 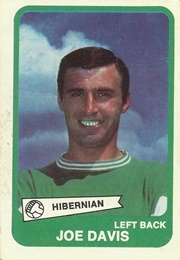 Douglas Coakley of A&BC Gum has advised that in 1968 they had terrible trouble in the factory mixing up the English and Scottish cards so after that year they made the two sets different colours each year. 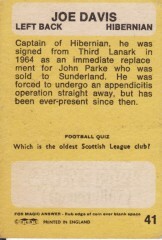 Apparently there are a four different versions of each card, where the photograph and text are the same but the Football Quiz questions differ. Team pennants folded in the yellow back card packets, hence the folds whenever you see these attractive pennants. The pennants have instructions to 'Cut out Pennant along black line' but thankfully not too many boys seem to have done this. The Wonderful World of Soccer Stars. This first of the more commonly available FKS sets, and a great favourite. The stickers are readily identifiable through the backs which have the player name, club and biography. Album price 3s 6d. Gallery: Arsenal, Burnley, Chelsea, Coventry City, Everton, Ipswich Town, Leeds United, Leicester City, Liverpool, Manchester City, Manchester United, Newcastle United, Nottingham Forest, Queen's Park Rangers, Sheffield Wednesday, Southampton, Stoke City, Sunderland, Tottenham Hotspur, West Bromwich Albion, West Ham, Wolverhampton Wanderers. Charles Buchan's Football Monthly ran for just under 23 years in 3 different incarnations, finally ceasing in June 1974. 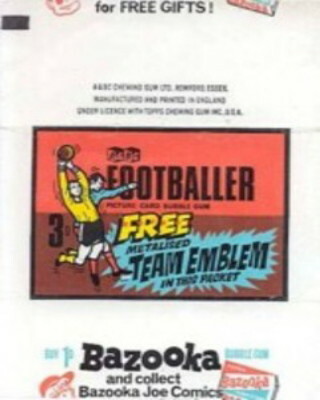 For more information see www.charlesbuchansfootballmonthly.com. The World Stars comprises a Souvenir Album with spaces for 80 small black and white stickers. The stickers came in four sheets, each with 20 stickers. A series of 6 small booklets, costing one shilling each, with colour photographs inside. A gallery is available for all photos from each of the mini-books. A set of attractive self-adhesive PVC stickers of First Division stars, produced in non-fade waterproof colours. These are very rare, with very few known to have survived. Northern Trancessories, based in Leeds, seems to have had an understandable bias for clubs around their area, as can be seen from the image gallery. I'm sure that there are a lot more of these to be discovered. If you are aware of any other examples please contact me via this email. The image below is from the shop display, with plastic pockets underneath where the stickers were displayed for sale. 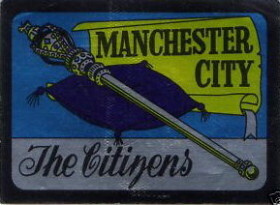 A set of attractive self-adhesive PVC stickers of First Division clubs, almost certainly produced at the same time as the 'Stars' depicted above. These badges have been seen in the shop display shown below, hence the name of the set. Note though, that the club badges below (with the spotted soccer ball) have also been seen sold in the same shop display, raising questions about which set is actually the soccer clubs. A set of attractive self-adhesive PVC stickers of First Division clubs. It would be reasonable to assume that this was a set of 24, coinciding with the two sets above, except that Huddersfield Town is known to exist. Huddersfield were promoted to the First Division in May 1970, suggesting perhaps that Northern Trancessories was still around at that time. A mystery set, having the same designs as the set above, but with gold centres rather than the spotted soccer ball. Huddersfield Town is again known to exist (with thanks to Roger Pashby's Huddersfield Town website), raising questions about when this set was sold. Alan Jenkins' Football Cartophilic Info Exchange blog has more images from this set. Bernard (Bouncing) Briggs appeared in the Hornet, Hotspur and Wizard comics. He was a powerful young fellow who earned his living as a General Dealer. He had a yard of his own in Slagton, and rode a motor bike with a sidecar made from an old bathtub. He was a keen amateur sportsman taking up various sports including Baseball, Boxing, Football, Ice Hockey, Rugby League, Tennis and Wrestling. Bernard excelled at all the sports he tried (from www.britishcomics.20m.com).The album was presented with the Hornet. The stickers inside appear to have been cut from a colour sheet.